Bill Gates’ Successor Quits Microsoft! THIS was predictable. We said it would happen some months ago. We wrote about him on numerous occasions as well. For anyone who still has doubts about Microsoft’ fast demise, this is possibly the seal. Ray Ozzie steps down from Chief Software Architect position, sets his sails for….? 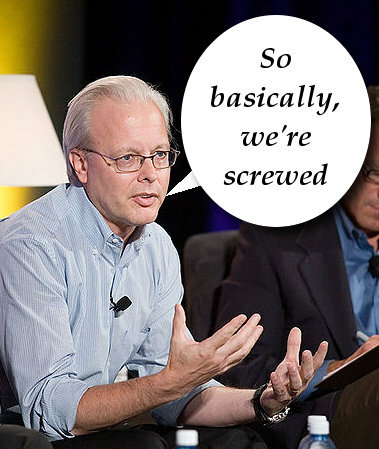 Ray Ozzie to Leave Microsoft: Has The Future Left the Building? Microsoft Silver Lie is Virtually Dead. Is Moon Lie Dead Too? M$ and crApple act as if we were still at the 80′s. crApple still manages to cut costs resorting to sweatshops in China, but the times of absurd profits are gone. And, M$ should acknowledge that and change. But it doesn’t. crApple is the next. Folks will no longer fall for the fool’s gold their pricey gadgets are. Apple has already captured a lot of its target market, which is a niche. It looks like Ray’s exit will cover some broken promisses in Massachusetts. After Bill Gates and Paul Allen created their first Microsoft software program in Cambridge, Mass., it’s been mostly downhill for the company’s R&D in the Bay State. The latest blow came Monday with the announcement that chief software architect Ray Ozzie would leave Microsoft. … In a controversy over ODF standards precipitated by the Massachusetts state CIO, IBM and Sun Microsystems pointedly noted that Microsoft had relatively few employees and facilities in the Bay State, putting pressure on the software giant to beef up its Massachusetts operations. The controversy has faded, and so has pressure on Microsoft to create more jobs and facilities in Massachusetts. Others should note from this example that there’s no pony at the bottom of the pile. Microsoft is an abusive monopoly that can not pay off everyone who wants to save money by dumping them. Just dump them already.